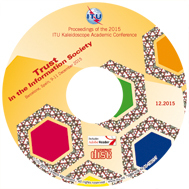 These Proceedings contain all the papers accepted for the conference ITU Kaleidoscope 2015: "Trust in the Information Society" - Barcelona, Spain, 9-11 December 2015. The aim of Kaleidoscope conferences is to identify emerging developments in information and communication technologies (ICTs) and, in particular, areas in need of international standards to support the development of successful products and services. The papers at K-2015 analyzed means of building information infrastructures deserving our trust. The event highlighted ideas and research that will help ensure the Information Society's growth in inclusivity and sustainability thanks to its trusted foundations. The papers accepted for the conference were reviewed by a panel of over 150 subject matter experts from leading academic and research institutions worldwide.